r.traveltime - Estimation of travel times/isochrones. 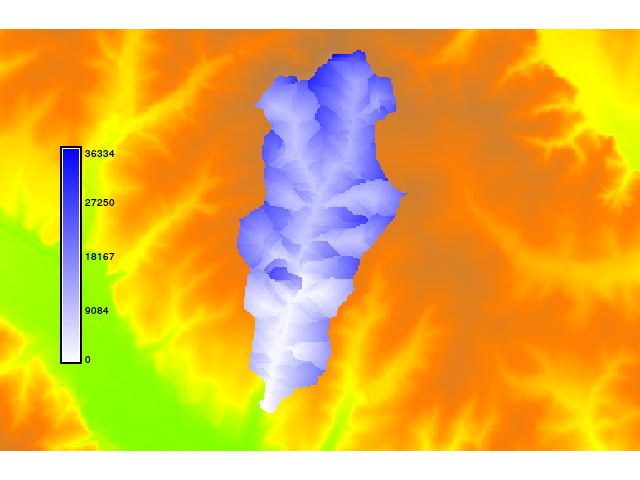 r.traveltime computes the travel time of surface runoff to an outlet. The program starts at the basin outlet and calculates the travel time for each raster cell recursively. A drainage area related threshold considers either surface runoff or channel runoff. Travel times are derived by assuming kinematic wave approximation. In order to derive channel flow velocities, an equilibrium discharge for each cell is calculated (Q=Area*specific discharge). The results can be used to derive a time-area function. This might be useful for precipitation-runoff calculations (estimation of flood predictions) with a lumped hydrological model (user-specified unit hydrograph). The program ist restricted to SI units (meters). The algorithm is recursive. Maybe it will not work with extensive datasets. It is assumed that the minimum slope is 0.001. For smaller gradients the program uses this value. Please not that the flow accumulation map must be defined as single direction. Multiple flow directions are not supported. Thus, the "SFD (D8) flow" option has to be set if, e.g., the r.watershed module is used to generate the input files (parameter s). The flow accumulation map should include positive values only (-a of r.watershed). Flow direction definitions are in accordance to the r.fill.dir program using the "agnps" format option. This example uses the North Carolina sample dataset. Kilgore, J. L. (1997): Development and evaluation of a GIS-based spatially distributed unit hydrograph model, master thesis, Virginia Polytechnic Institute and State University. Melesse, A. M., Graham, W. D. (2004): Storm runoff predicition based on a spatially distributed travel time method utilizing remote sensing and GIS, Journal of the American Water Resources Association, 8, 863-879. Muzik, I. (1996): Flood modelling with GIS-derived distributed unit hydrographs, Hydrological Processes, 10, 1401-1409.